“Common Golf Injuries,” Arlosoroff, MD. Palm Beach Times, September, 1998. “Metastatic Disease to the Hip: Guidelines for Treatment;” Berman, M.D., Henzes, M.D., Arlosoroff, M.D. Scientific Exhibit, AAOS Meeting, New Orleans, 1994. “Femur Fractures After Total Hip Replacement,” Berman, M.D., Arlosoroff, M.D., Submitted to Orthopedics, Fall 1993. “Ankle Stability Tester: A quantitative Diagnostic Technique for Lateral Ankle Instability;” Siegler, Ph.D., Berman, M.D., Arlosoroff, M.D. Submitted to AAOS 1992, paper and exhibit. “TAR Syndrome and its Effects on the Knee;” Arlosoroff, M.D., Davidson, M.D. ; Presented at Shriners’ Conference, December 1992. Israel Davis Cup Team, 1978-1982 including matches against West Germany, Hungary, Austria, Switzerland, Yugoslavia and Monaco. Professional Tennis Circuit 1979-1981. Achieved world ranking in both singles and doubles. 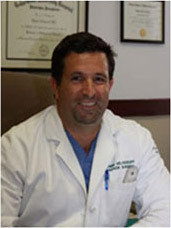 Dr. Chaim Arlosoroff was born in Haifa, Israel and moved to Palm Beach county in 1994. He began working at Orthopaedic Care Specialists in 1999. He is married to Stacey Arlosoroff and they have two children; Sophia and Benjamin. When Dr. Arlosoroff is not working he enjoys diving, fishing, skiing, tennis and spending time with his family.